Strabismus, also called crossed eyes, occurs when both eyes don't point in the same direction. Although the condition is very noticeable if there is a serious alignment problem, even subtle changes in alignment can affect your vision. You may experience double vision, blurred vision, eyestrain, headaches or depth perception problems if your eyes don't work together efficiently. In severe cases, strabismus may lead to another condition called amblyopia, or lazy eye. If you have amblyopia, your brain may actually "turn off" the images from one eye. Although you may have been able to compensate for your strabismus and amblyopia symptoms when you were younger, age-related changes in the lenses of your eyes may make compensation impossible eventually. Aging causes a loss of flexibility in the clear lenses of the eyes that help focus light rays on your retinas. As a result, your eyes have difficulty adjusting when you switch your focus from near to far objects. The condition, called presbyopia, makes it difficult to see close objects clearly. It's the reason why people need reading glasses, bifocals, or trifocals as they get older. You may suddenly develop a problem with double or blurred vision, in addition to difficulty with your near vision, if you have a previously undiagnosed case of strabismus. Problems can also occur if you have amblyopia and the vision in your good eye declines. Both of these conditions may increase your risk of falls and broken bones as you grow older. Vision therapy can help strengthen the muscles that control your eyes and improve their alignment, reducing or eliminating your symptoms. Vision therapists use activities, games, prisms, filters, balance boards, and other tools to help you improve your usable vision. Vision therapy can be particularly helpful if you have amblyopia. Although it was once thought that improvement was impossible if therapy wasn't begun during childhood, recent studies have proven that it's possible to enhance the brain-eye connection at any age. In one 2011 study, University of California at Berkeley researchers asked adults who had amblyopia to play a computerized target game while their good eyes were patched. After just 40 hours of play, visual acuity improved by 30 percent and three-dimensional depth perception also improved. Stroke patients who participated in a recent study conducted by the University of Rochester Medical Center's Flaum Eye Institute noticed a decrease in blind spots after vision therapy. The patients experienced damage to the primary visual cortex, the part of the brain that processes information received from the retinas. Study participants watched flashing circles of moving dots or striped patterns on a digital screen. After using the software regularly, blind spots decreased in size, and the patients correctly identified the location and orientation of the circles 80 percent of the time. Despite long-held beliefs that vision damage caused by strokes can't be treated after six months, all of the patients in the study had long-standing damage yet experienced significant improvement in their vision. Although vision therapy may not restore full vision, any improvement can significantly affect the quality of life in stroke patients. 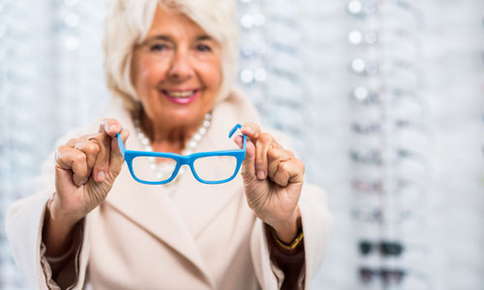 Have you begun to experience vision problems as you've gotten older or after a stroke? Vision therapy may be able to help you improve your vision or restore lost vision. Call our office to schedule an appointment to discuss your symptoms and receive a comprehensive vision examination.